The McLaren MSO 12C is a concept machine that showcases the British supercar maker’s new McLaren Special Operations division rather than a new model in the line-up. If the looks of the 12C aren’t enough for you then the guys at MSO have made some small visual changes, including new rear wing vents and a new bonnet, and added light weight wheels with a diamond-cut pattern. As you’d imagine, the changes to the exterior aren’t very dramatic and you really have to look hard to see them, but McLaren’s engineers haven’t stop there. They’ve also worked hard within the cabin to justify the MSO tag, so owners get more carbon fibre and a new instrument panel and body coloured accents throughout the cabin mark out this MSO McLaren. There are no changes to the McLaren 12C specs, so you’re still looking at a car that’s capable of a 207mph top speed and a 0-62mph time of 3.2 seconds. 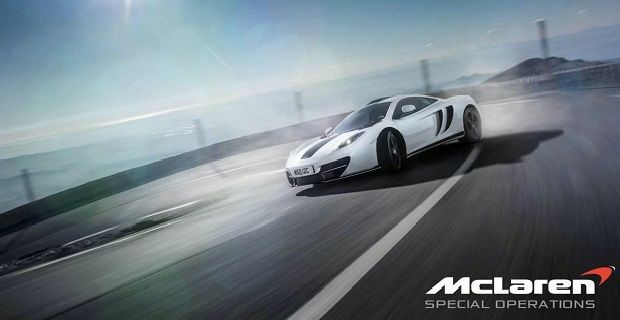 There are no plans for the MSO 12C concept to go into production as this car’s just been made to showcase MSO. McLaren don’t sell many cars, but around 20% of those they sell are personalised in some way, so McLaren has decided to formalise this with the creation of the MSO division. We’re not sure what to make of special cars being given a make-over to make them even more special. Taking a Ford Fiesta and adding a little speed and a better look makes sense and it also makes sense to take a BMW 3-Series and make it into an M3, but we’re really not sure that McLaren needs to do any work to make their MP4-12C more attractive or more distinctive than it already is. But we don’t have the money to buy one, so perhaps your perspective changes when you park your 12C next to another one outside a casino in Monaco.